Muslims doing the hajj pilgrimage to Mecca have for years clambered into cars and buses after finishing in one holy city and headed through the barren Hijaz mountains on a five hour drive to Medina, another sacred place. Now they have a new option. 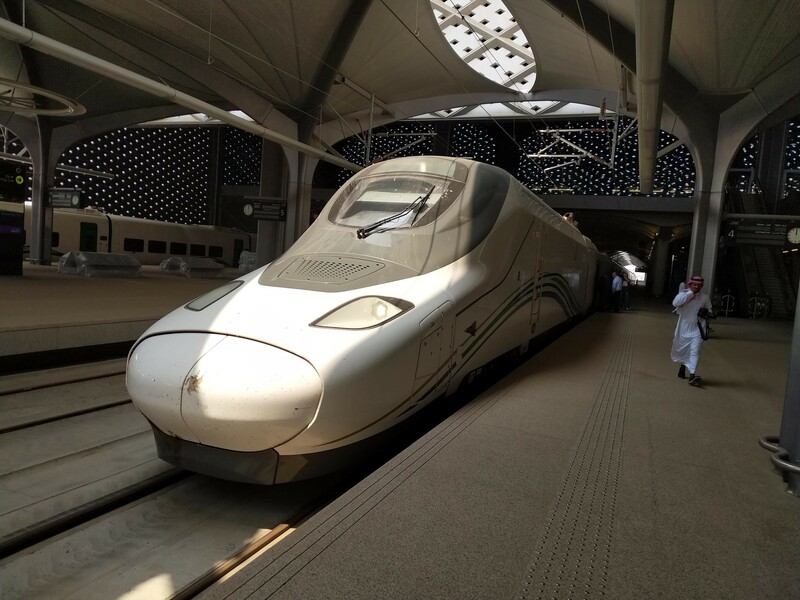 Saudi Arabia earlier this year opened the $15 billion Haramain High Speed Railway, a 300km/h line between the cities that was built by the Spanish company Talgo with technology designed to protect it from sand and extreme heat. The project is one of several infrastructure initiatives aimed at reviving the kingdom’s economy as Crown Prince Mohammed bin Salman pushes his “Vision 2030” plan to create new engines of growth beyond oil. The hope is that the 450km train line will help boost the number of umrah pilgrims visiting Saudi Arabia from 6.8 million this year to 30m by 2030 and that they, in turn, will inspire the creation of more private sector restaurants, hotels and tour operators. Another passenger said she was scared because it is the first time she travels by train. “But alhmdulilah (thanks to God) it was a smooth ride and now I’m thinking I might use it everyday,” said Renad Saleh, a 27-year-old student who lives in Jeddah but goes to school in Umm al-Qura University in Mecca. Officials say the train can handle up to 60 million travelers annually and will eventually link up with a proposed railway project connecting the capital Riyadh with the west coast. The danger, say sceptics, is that the rail line becomes another case of state oil revenues being used for stimulus spending that has limited trickle down benefits, reviving memories of plans for other magaporjects, like Riyadh’s new financial district, that have failed to take off. Karen Young, a Gulf scholar at the American Enterprise Institute, said the move was a departure from ambitious Saudi plans that relied on foreign direct investment and a return to the traditional pattern of oil revenues fuelling state spending. “The tourism plans fit this pattern and are a very good source of new economic activity, but not necessarily of creating jobs for nationals, at least at the outset of construction in mega-projects like the railway and airports,” she said. Saudi nationals are generally uninterested in construction jobs, which tend to be done in the kingdom by immigrants from South Asia. But Nabil al-Amoudi, transport minister, said operating the train would provide 3,000 jobs to Saudis as drivers, conductors, stewards and ticket sellers. Saudi Arabia wants to increase the inflow of visitors for both hajj and umrah, the two main Muslim pilgrimages. While hajj must be performed once in a lifetime by all able-bodied Muslims, umrah can be performed at any time of the year. More than two million umrah pilgrims arrived in the kingdom during the current season, and for the first time they were allowed to travel to any city in the kingdom for up to 15 days after visiting Mecca and Medina, a step to encourage more spending. The authorities also hope the rail line will revive one struggling urban project, the King Abdullah Economic City, where the train will stop. The city was launched a decade ago but has struggled to attract investment and residents. Persuading foreign investors to come to the kingdom has become increasingly difficult as the country continues to deal with the fallout from killing journalist Jamal Khashoggi, but officials hope that ramping up state spending would boost growth and investors would eventually come around. The government unveiled an expansionary budget earlier this month, pledging to increase spending on infrastructure and transportation by 28% in 2019. It wants to take advantage of higher oil prices to boost economic growth in the private sector and reduce unemployment which remains high at 12.9%. “2018 was a year to contain unemployment among Saudis, but there is good news as we continue a full restructuring of the labour market,” said economy minister Mohammed al-Tuwaijri who predicted that unemployment rate would begin to go down next year. The Haramain train will also stop at another landmark infrastructure project: the new Jeddah international airport, which started serving some local routes over the summer and is expected to become fully operational by the second quarter of 2019. The new terminal, built over an area of 810,000 sq m and cost $9.6 billion, is expected to serve around 80m passengers annually, more than double current capacity.